This romantic gift set is just a reminder of her beautiful smile that lights up a room when you see her. A sweet way to say "I Love You." The Everlasting Love PANDORA gift set includes the Open My Heart, Love You Forever and Infinite Shine charms. 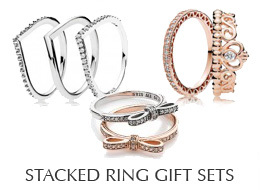 This PANDORA gift set is boxed, gift wrapped and tied with ribbon. Please note - gift wrap may differ from what is shown in the photo above. Ships Monday, April 22 if ordered in the next 2 days, 2 hours and 5 minutes! The Everlasting Love PANDORA gift set includes the Open My Heart, Love You Forever and Infinite Shine charms. This PANDORA gift set is boxed, gift wrapped and tied with ribbon. Please note - gift wrap may differ from what is shown in the photo above.